"They Gave Their Lives...Just For THAT?" Comics! Sometimes They "Dare To Be Different"! 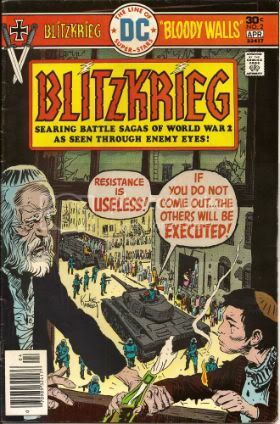 It's okay, Bill Schelly, I think I've mentioned BLITZKRIEG enough for everyone! It was 1976 and it was time to see WW2 “through the eyes of the enemy”. This was hardly unprecedented. 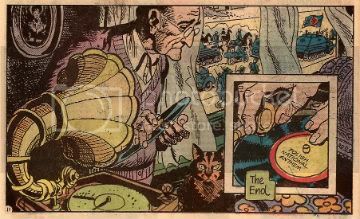 Joe Kubert (b. 1929)and Robert Kanigher (1915 – 2002)had previously worked up and on Enemy Ace in Star Spangled War Stories. Said series was an innovative look at WW1 (1914-18) through the character of a German air ace modelled upon The Red Baron (Manfred Von Richthofen not Snoopy). These stories are collected in their entirety in SHOWCASE PRESENTS: ENEMY ACE which is a plump lump of B/W brilliance (VERY GOOD!). Giving in to the temptation to gorge on the contents, however, results in an unavoidable recognition of the repetition in their structure. If read in the short bursts as it was initially published it becomes clear that this repetition was entirely intentional. Read any individual Enemy Ace story and you get a complete story with all the information required to understand the context and point of what was on the pages. Modern readers may also finds some of the contents a bit broad at best and belief defying at worst. That’s understandable but tends to underestimate the fact that these are primarily stories and their intention is principally to entertain and then, typically, to make a point. To get the most out of them it’s probably best to view them as a form or parable rather than an attempt to accurately reflect reality. You probably remember The Parable Of The Killer Skies from Sunday School. The contents of Showcase: Enemy Ace will always be of interest thanks to the astonishing performance of all the artists involved; Joe Kubert, Neal Adams, Frank Thorne, Howard Victor Chaykin and John Severin. There were indeed giants in those days but it’s worth stressing that of these lofty talents Joe Kubert’s scalp was the most sky scraping. I’m a like me some Joe Kubert, I do. 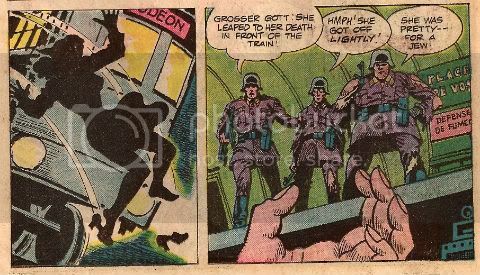 But the fact that these stories are still readable is evidence of the rock solid craft brought to the task by Robert Kanigher. 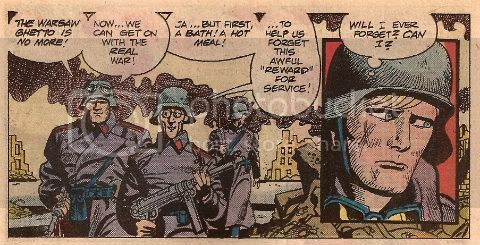 A lot of people liked Enemy Ace but not enough people, sales on the book kept falling and, as Editor, Kubert was forced to drop the series and replace it with The Unknown Soldier. (Don’t worry if I’m going to talk about The Unknown Soldier it will be a time other than this one.) The point here is that the success of Enemy Ace is due to the fact that the techniques involved were as taut as Cher’s face. So Enemy Ace wasn't a total success but it was very popular which is more than can be said for The War To End All Wars (which is a case of false advertising if ever I saw one). Of course after the world got its breath back it decided to produce the more popular sequel WW2. And it was in this setting that Kubert and Kanigher attempted to replicate the success of their “through the eyes of the enemy” approach. But because you are paying attention you are now thinking why do that? If Enemy Ace couldn't pull in the punters why launch a whole new series with a similar premise? The DC Explosion is why. It’s aptly named because it was about as controlled and disciplined as an explosion. The fact it was almost immediately followed by the DC Implosion should tell you just how successful cramming as much stuff onto the spinner racks turned out to be.Given the urgent need for fresh recruits to be rushed to the Retailing Front many comics were sacrificed on the spinner racks. BLITZKRIEG was amongst the cannon fodder. Sadly the big thing about BLITZKRIEG is how half-baked it seems. There's an interesting premise ("Yeah, but how was WW2 for The Bad Guys?") but it just doesn't get any traction. The stories themselves are solid enough to start with but as the series progresses they start to become more hazy, lacking a point around which Kanigher can cohere his scripts. It's a good framework though; following three German soldiers through the war and having them reflect the mindset of "The Enemy" (who unsurprisingly will be surprisingly like "Us"). The first problem is that Kanigher has too many protagonists. Sgt. Rock and Enemy Ace have a strong central figure around which events can orbit and whose experiences provide the Reader with an "in". 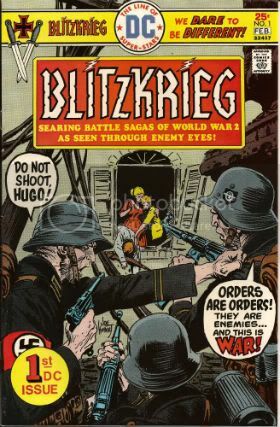 BLITZKRIEG has Franz, Ludwig and Hugo. Franz is blond and handsome representing The Intellectual, Ludwig is a meathead always thinking of ladies and Hugo is a speccy bald weasel always thinking about food. It's fairly clear that they are three separate aspects of Man and their very separation is that which blinds them to the fact that if all three were united in one individual more perspective would be available, possibly even enough to grant them the wit to realise that what they are involved in is both inhuman and insane. 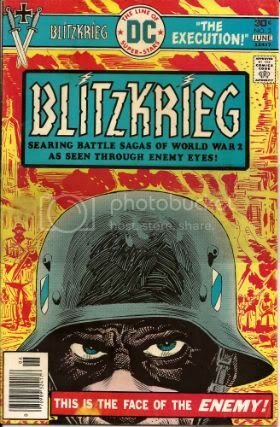 And, to be fair, BLITZKRIEG doesn't stint on the depiction of the horrors perpetrated by these ordinary guys. 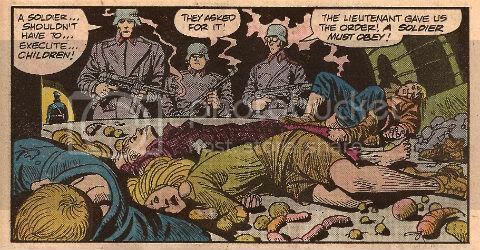 Throughout the course of this series the "heroes" kill women and children, both armed and unarmed, massacre P.O.W.s and are active in the horror of the pacification of The Warsaw Ghetto. It's unpleasant stuff and there lies BLITZKRIEG's second main difficulty. By focusing on this barbaric string of events it's hard to root for our Three Stooges. The series focuses so hard on these atrocities that there is barely even room for our three chums to pop up and offer their character revealing insights ("I like bread! ", "I like ladies! ", "I like Butterflies"! Jesus, these guys make Brick Tamland look nuanced.) The Reader never gets to know them because they are hardly present in the narrative and when they are they are always saying the same things. They never change and they never learn no matter how bad things get, no matter how stained their hands. But then maybe that's the point. Maybe that's how these things happen. Franz, Ludwig and Hugo appear totally at the mercy of events, pulled under by the current of History only to resurface briefly to state to themselves (and to us) the only things that keep them functioning; their appetites and their belief that this is necessary, or at least unavoidable. They are trapped in a narrative not of their making and they cling to sanity only by reducing themselves to their most basic, unthinking needs. That would be good, I think. But I only think that, I don't know that. And I think I only think that because that is how I am naturally inclined to think. I don't believe there is much on the actual pages to convince me that the authors (writers and artists; comics is a gestalt thing remember) are moving me by design to these thoughts. But then inspiring thought in a reader isn't such a bad thing. Even if the particular colour of that thinking is an unintended by product. Because, maybe, WW2 is the kind of thing that happens when people stop thinking and let other people do that for them, particularly when those people doing the thinking are the kind of people who should be heavily medicated and monitored for their own safety. BLITZKRIEG has other problems too. The premise is a deceptively complex one and the truncated nature of the episodes (roughly 11 pages) doesn't allow enough room for the authors to really start working. What a comic like BLITZKRIEG needs to succeed, amongst other things, is room to breathe. In the '70s comics authors were rarely allowed this luxury. Sure, modern comics do get this break but if comics from 2000 to 2011 have shown us anything it's that if you give comics creators room to breathe often that's all they do; breathe. Then there's the nature of the conflict BLITZKRIEG depicts. Enemy Ace not only has a single protagonist but also benefits from being set in a conflict where "Good" and "Bad" are entirely more nebulous labels, and the meaning of these is further diffused by the concepts of honour, duty and tradition. These concepts had pretty much worn out their welcome by the time WW2 rolled around, sure, they lingered and were important but by no means to the same extent and the longer the war rolled on the more denuded of meaning these concepts became. In a War in which people are putting other people in ovens, reduced to cannibalism, arming their children and dropping nukes on civilian targets honour, duty and tradition aren't really going to be able to cut it. Hell, even "Good" is going to have its work cut out for it. Presenting WW2 "through enemy eyes" would require rather more serious thought than BLITZKRIEG can muster. Given the moral morass of its setting, its uncharismatic leads, fuzzy storytelling and general lack of polish BLITZKRIEG fails to achieve its lofty ambitions but...but...even at its worst BLITZKRIEG is wholly innocent of the most objectionable charge that could be raised at such an endeavour. At no point are the actions of the Germans glamorised or presented as attractive. That would be the worst thing and BLITZKRIEG doesn't do that thing. So, not so accurate then but accurate enough if accuracy isn’t too much of a concern. And I don’t want it come across like special pleading but back when steak was a breakfast cereal research was proper work. You had to leave the house and visit these buildings called "libraries" which had "books" in them with "pages" and, yeah, I know it sounds like a madman's dream or something. Luckily, the ever reliable Sam Glanzman leaps into the trench of doubt and picks up the authenticity potato masher and chucks it back in your face with some pics'n'facts spreads about tanks and planes (The Panther Tank, Dornier DO-335A and the F-40 Corsair) before supplying a "3-D table-top diorama" where kids could paste the pictures to cereal boxes and through the judicious use of scissors and imagination recreate their own hellish scene of human suffering to treasure forever ("U.S.S. Buckley Rams The U-66"). Or at least 'til the cat got hold of it. The intentions of all involved are, I’d say, honourable and good but we all know where the road paved with those leads. Except Ernest Hemingway who said that the road to Hell was paved with stuffed donkeys, but that guy liked his pop a bit too much. Obviously this comic isn't Hell on paper but the good intentions of all involved don’t stop it being more interesting than successful. Way more interesting than successful in fact but since I like interesting things I’d ultimately call BLITZKRIEG GOOD!, although as entertainment it’s probably EH! 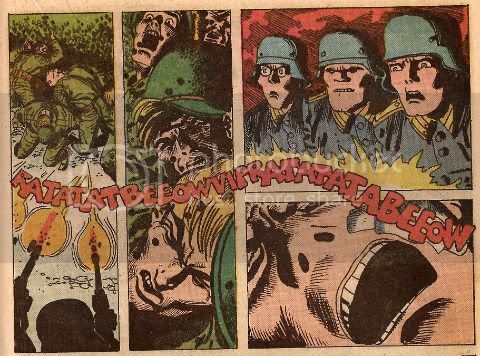 Having said that though there is the odd panel like this one below which brings BLITZKRIEG back up to GOOD! And like moral certainty - I'm GONE!